Join attorney Jacob J. Sapochnick for a free online webinar hosted by SimpleCitizen this evening on Tuesday, February 27, 2018 from 6-7 p.m. (Pacific Standard Time) and 9-10 p.m. (Eastern Standard Time). 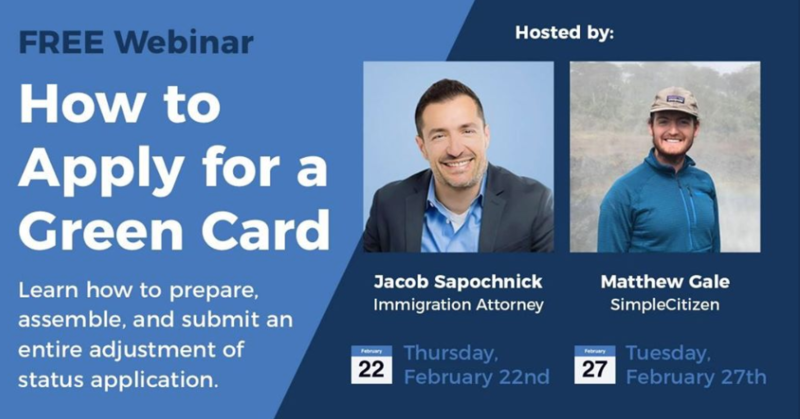 Attorney Jacob Sapochnick will teach you how to apply for a marriage based green card and how your family members can obtain permanent residence. In this free online webinar you will learn how to prepare, assemble, and submit an entire adjustment of status application. Throughout our practice we have filed thousands of adjustment of status petitions helping foreign nationals obtain permanent residence from all over the world.